Proof is probably one of the most difficult concepts to teach in high school mathematics. In this short post, we are going to discuss a simple activity that can be used in teaching mathematical proofs in Geometry. First, we can use a rectangular paper, fold it in the middle, and cut through the diagonal. Of course, before cutting the paper, we should clarify our basic assumptions. 1.) The paper is a rectangle. 2.) The fold is straight and connects the middle of the opposite edges. 3.) The cut is a straight line. First, we have learned that triangles with two congruent sides are called isosceles triangles. This is called a definition. We also know that in isosceles triangles, the measure of the base angles are equal. In the cut below, we can verify this by overlapping the base angles. In mathematics, this is not enough. Even though we can overlap a triangle, it does not represent other triangles. To say that this is true to all triangles, we need a proof. First we know that the length of AB and AC are equal. 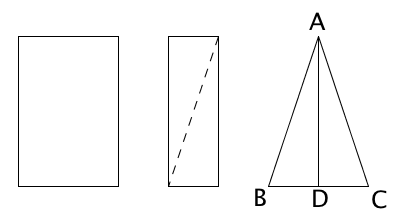 This is because they are formed by cutting the diagonal in the second figure above. We need to show that if , then . First, we need to draw a bisector of and let be its intersection with . So, by SAS congruence, triangle . In the proof above, I skipped the symbol such as , so . This is emphasized in many books so it is up to the teacher whether to include these steps.